Bookmakers have said that their worst result of the 2019 Cheltenham Festival would be Champ winning Wednesday's Ballymore Novices' Hurdle. Named to honour legendary Champion Jockey Tony McCoy, also known as AP, or simply Champ, the four-time winner is closely related to three-time Gold Cup winner Best Mate, and runs in the famous green and gold hoops of JP McManus. He heads the Ballymore Novices' Hurdle betting at no bigger than 3/1, and is likely to be the highest rated horse in the field on official ratings, but trainers Gordon Elliott and Willie Mullins have strong challengers to take him on in fellow Grade 1 winners Battleoverdoyen and Klassical Dream. The Cheltenham betting does suggest Champ will be superior in day two's opener, but is he worth betting on, or is there a better tip? The Supreme Novices' Hurdle is a 2m 5f Grade 1 hurdle race open to horses who won their first hurdle race this season. Worth £70,337 to the winning connections, it is the first race on the second day of the 2019 Cheltenham Festival. When applying the key Ballymore Novices' Hurdle trends to this 2019 field, four horses jump out: Battleoverdoyen, Birchdale, Champ and Easy Game. Delving deeper into that, the weakest link is Birchdale, who lacks the requirement for having won at twice on galloping tracks, and if we're being specific, Champ and Easy Game have had too many runs - though that could be off-set by them having good breaks before next week's test. That leaves the unbeaten Battleoverdoyen as the best Ballymore Novices' Hurdle tip, based on trends, and the betting certainly doesn't put you off either, with 5/1 available at Betfair. Free-running Champ seemed to settle much better at Newbury last time out when owner JP McManus's number one jockey Barry Geraghty rode him for the first time, and is likely to rank the highest-rated novice in the field. He is a worthy favourite, though not an attractive price at 3/1 with William Hill. Easy Game is a great each-way bet at 33/1 with the same firm. He's fresh, having not run since December, and will be waited with to come with a late run, potentially causing an upset. "I didn’t go to Leopardstown with Battleroverdoyen because I thought he was after having three runs pretty close together and needed a break, but he’s in good form now. "He might lack experience with only two runs over hurdles, but I’m happy that he jumps well enough and has done all he can do. Timing wise, I thought it was the right thing to do, to go straight to Cheltenham and I think the racing will suit him there." "Galvin, who won his third hurdle at Ayr recently, will also go for the Ballymore Novices' Hurdle." "He will go over two miles five in the Ballymore. He has been very good and he has plenty of experience. I think our novice hurdlers are a particularly strong bunch." "Easy Game has won his last two races in Graded races at Navan and has plenty of experience, including winning at the Galway Festival in July. “It’s been the plan since Galway and we just picked out a couple of races to fit in. Hopefully it will be onwards and upwards from here, as long as there is racing. He jumps very well. He’s a nice horse to have. "He came home sound as a pound after his fall at Cheltenham last time out. It was disappointing, obviously, but that's jumps racing for you. He's not a bad jumper, and I don't think he's the kind of horse that would have his confidence knocked by a fall. We'll get plenty of schooling into him before the race." Champ has all the hallmarks of a champion; his mother China Sky is a half-sister to three-time Cheltenham Gold Cup winner Best Mate, he has never finished out of the first two in seven runs, and took the step up to Grade 1 level in his stride last time out. Big positives for JP McManus's novice are his ability to handle any going, stay the distance and win travel very strongly. The chief negative is that he can pull too hard, an issue jockey Barry Geraghty seemed to sort out when riding him for the first time on his latest run. Battleoverdoyen has only run twice over hurdles, but trainer Gordon Elliott is satisfied he jumps well enough to get away with that lack of experience at Cheltenham. He's proven himself capable of speed and stamina, having won over 2m and 2m4f, and Elliott also feels he will really be suited to how races are run at Cheltenham. Where he's won - three galloping, undulating courses - also points towards his likelihood of being suited by Cheltenham. Klassical Dream, is lining up here and not in the Supreme Novices' Hurdle, will be racing beyond 2m2f for the first time - and he didn't win the Grade 1 he ran in over that distance. Trainer Willie Mullins believes he will make into a good stayer, and is leaning towards testing that at Cheltenham. The 2m Grade 1 he won last time at Leopardstown, has proven Ireland's best guide for the Ballymore, but up until 2018 it was run over 2m2f, and the horses who have won both races had also previously won over 2m4f. City Island hasn't been tried in Graded company, but did win over 2m5f at Galway - albeit later being disqualified owing to the prohibited substance arsenic getting into his system via a seaweed based food supplement. He's also got top Cheltenham heritage, his dam Victorine being a half-sister to Champion Hurdle winners Morley Street and Granville Again. In additiion, he's owned by the Mulryan family, who sponsor the Ballymore Novices Hurdle, and are keen to win it. Brewin'upsatorm was going the right way until falling behind Birchdale at Cheltenham last time out. He was upsides the winner when coming down at the last, and now boasts a rating of 146 - one of the highest in the field. If that is to be believed, the Olly Murphy-trained six-year-old, who will be ridden by champion jockey Richard Johnson, must not be ignored. But he's still lining up with just one hurdle win, and nothing over further than 2m. Easy Game was being ridden at the front of races over the summer, and did win at Galway and Killarney, but as the competition increased, he began to struggle. At Navan in November tactics were changed, he was ridden with great restraint to win a Grade 3 over 2m4f, and repeated the feat in a Grade 2 over the same distance less than month later. 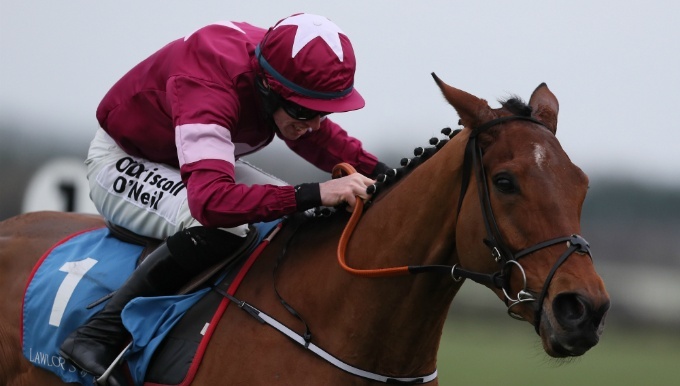 He has bags of experience, and the way he's ridden will be accommodated at Cheltenham.